CERN-LHC: What is big bang? Many of my friends are not aware of the Big Bang and CERN experiment which may find answers to some of the biggest questions about our world and universe. What is the big bang model? 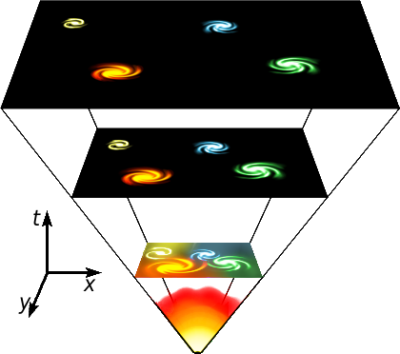 According to the Big Bang model, the universe expanded from an extremely dense and hot state and continues to expand today. A common and useful analogy explains that space itself is expanding, carrying galaxies with it, like raisins in a rising loaf of bread. General relativistic cosmologies, however, do not actually ascribe any ‘physicality’ to space. The European Organization for Nuclear Research (CERN) is the world’s largest particle physics laboratory, situated in the northwest suburbs of Geneva on the Franco-Swiss border. The essential idea is that the universe has expanded from a primordial hot and dense initial condition at some finite time in the past and continues to expand to this day. The CERN is trying to create the big bang in a lab using LHC. The Large Hadron Collider (LHC) is the world’s largest and highest-energy particle accelerator complex, intended to collide opposing beams of protons charged with approximately 7 TeV of energy. Its main purpose is to explore the validity and limitations of the Standard Model, the current theoretical picture for particle physics. It is theorized that the collider will produce the Higgs boson, the observation of which could confirm the predictions and missing links in the Standard Model, and could explain how other elementary particles acquire properties such as mass. Scientists have hailed a successful switch-on for an enormous experiment which will recreate the conditions a few moments after the Big Bang. They have now fired two beams of particles called protons around the 27km-long tunnel which houses the Large Hadron Collider (LHC). The first beams were circulated through the collider on 10 September 2008, and the first high-energy collisions are planned to take place after the LHC is officially unveiled on 21 October 2008. Author adminPosted on September 10, 2008 September 10, 2008 Categories AstronomyTags bang model, cern, cern experiment, cosmologies, elementary particles, energy collisions, energy particle accelerator, european organization, finite time, higgs boson, highest energy, initial condition, large hadron collider, largest particle physics, largest particle physics laboratory, lhc, northwest suburbs, particle physics laboratory, physicality, swiss border2 Comments on CERN-LHC: What is big bang?